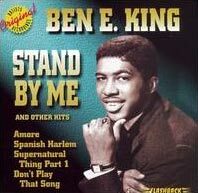 Ben E. King, best known for his 1961 R&B hit “Stand By Me”, has passed away at the age of 76 after suffering from coronary problems according to his agent. King, who was born Benjamin Earl Nelson in 1938, started his singing career as a member of the Five Crowns, shortly to be folded into the Drifters R&B group whose first hit was “There Goes My Baby” back in 1959. After leaving the Drifters in 1960, King hit the solo circuit under the stage name Ben E. King and after his first solo hit “Spanish Harlem” co-wrote what was to become one of the Songs of the Century according to the Recording Industry Association of America. “Stand By Me” proved to be very successful for King and along with two other of his songs was named as one of the Rock and Roll Hall of Fame’s 500 Songs that Shaped Rock and Roll, and the album it was released on also earned a Grammy Hall of Fame Award. “Stand By Me” also hit the #1 spot on the Billboard Top 10 – once in in 1962 and again in 1986 when it was reissued for the movie of the same name. Over the course of his career, Ben E. King had 12 Top 10 hits and 26 Top 40 hits. While inducted into the Rock and Roll Hall of Fame as a member of the Drifters, he has yet to be inducted as a solo artist even though he has been nominated. King is survived by his wife of 51 years, Betty. There’s no questioning that “Stand By Me” is one of those timeless classics that helped shape music over the years.